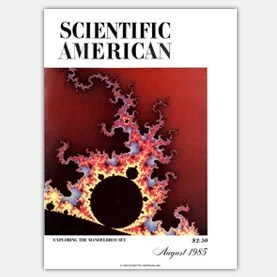 Back in 1985 A.K.Dewdney published an article about the Mandelbrot Set in his Computer Recreations column in Scientific American that helped kick off the Mandelbrot mayhem. As a tribute to Mandelbrot after his death the article is now available as a PDF on their website. Click the following image to access the page. The ads for the super high power computers of the time are almost as enjoyable as the main article to read. Here is a sample of the new CA music I have been experimenting with that is now included in Visions Of Chaos. Inspired by this page describing WolframTones. Take a middle “strip” of a running CA (the orange line in the above video) and map it to a scale of notes. The cellular automata is a “Next Nearest Neighbor Cellular Automata” as described in this paper by Wentian Li. Here is another documentary about the world of fractals and chaos that is worth watching. If you are into fractals give it a watch. I tried to get some mates of mine to watch it and they had the instant response of “NO! Not this nerd crap you are into!”. Some people do not want to be educated. Benoit Mandelbrot, the “father of fractals” is dead at 85. Here is a recent video of a presentation Mandelbrot gave at TED. Mandelbrot (I feel I should refer to him in the first person “Benoit” as even though I never corresponded with him or met him, I thought of him as someone who had a similar mindset and someone I would have loved to bump into and have a chat with over a few beers one day). His seminal book may not be the easiest read, but should be on the shelf of any fractal enthusiast. He always had a very humble and humerous side to him (as the TED video above will show). He will be greatly missed. Thankfully his legacy will live on and be explored and extended for many years to come. There are a bunch of interviews with him (as PDF downloads) on his Yale page here to give a deeper insight into his life. Initial images of the Mandelbrot Set is what got me (and I am sure countless others) interested in fractals. Without those first glimpses Visions Of Chaos would not exist or be nowhere near what it is today. Click the following image to see my gallery of a small sample of what is to be discovered in the Mandelbrot Set. Also, here is a sample movie with some zooms into the Mandelbrot Set that shows the infinite structure his simple z=z^2+c formula can produce.